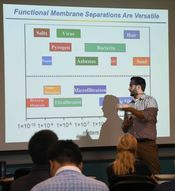 This year’s Notre Dame-Purdue Symposium on Soft Matter & Polymers was held on September 16 at Purdue’s campus in West Lafayette. “The symposium functions as a platform to share research between schools in Indiana and neighboring research universities, to network between research groups, and to seek opportunities for collaboration,” said Haifeng Gao, associate professor in the department of chemistry & biochemistry at Notre Dame. More than 120 faculty, postdocs, and students attended, including researchers from Indiana University Bloomington and University of Illinois Urbana-Champaign. Dr. Gao and Dr. Jianguo Mei, assistant professor of chemistry at Purdue, are co-organizers of the event. The research presented by faculty during the morning and afternoon technical sessions covered polymer synthesis, characterization, and computation. The research touched on various applications of polymer materials in batteries, solar cells, sensors, nanomedicines, tissue scaffolds, and membrane separation. 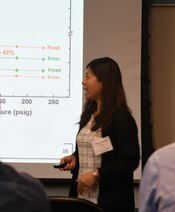 “The symposium was a great event and provided an excellent platform for researchers from both universities to network and share their cutting-edge research in the field of polymers and soft materials,” said Dr. Ruilan Guo, assistant professor. “The strong presence of junior researchers at the event made it an excellent opportunity for young researchers to network and to begin developing collaborations within the state of Indiana," added Dr. William Phillip, associate professor. Both Guo and Phillip are faculty members in Notre Dame’s department of chemical and biomolecular engineering, and presented at the symposium. From among the 65 poster presenters, best poster awards were given to Yuichi Hirai and Tanner Corrado (ND); Qian Li, Monessha Nambiar, Shane Russell, and Aristide Gumyusenge (Purdue); Ziyuan Song (UIUC), and James Dobscha (IU). A complete list of presentations and posters is attached. Poster winners Yuichi Hirai, Monessha Nambiar, Tanner Corrado, Shane Russell, Aristide Gymyusenge, James Dobscha, and Ziyuan Song, with event organizers Prof. Jianguo Mei and Prof. Haifeng Gao. Originally published by Heidi Deethardt at nano.nd.edu on October 26, 2017.